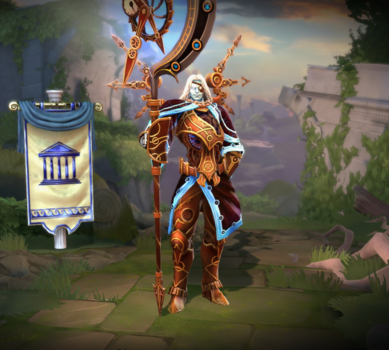 Chronos is one of the playable Gods in SMITE. Existence is measured in age. How many years has a mortal lived? What was the construction date of the Parthenon? When were the cosmos formed? Time begins at birth, at creation. But, inevitably, time for all things comes to an end. Except, of course, time itself. Bearer of the clock of eternity, rimmed by signs of the Zodiac, the Keeper of Time, Chronos, counts every tick of the second hand, preventing interference with that essential forward momentum. If he knows who or when the eternal clock was wound, Chronos does not tell, but upon the first stroke, he came to be. Emptiness was the ocean, then, and his only companion was Ananke, Queen of Fate. Together, their powers divided the vastness into heaven and earth and sea and sky. Thereafter, Chronos became an observer, the watchman of infinity. Patient to a fault, Chronos knows no urgency. He does not fear pain, or war, or death, for he is time itself and will outlast all. For this reason, his presence on the field of battle is alarming. This war between Gods must portend a conclusion so dire as to threaten the very existence of time. Perhaps, all the Gods should begin counting the seconds of the eternal clock. There may be few of them remaining. Grants up to 125 Magical Power at 50 minutes. Section I: Heal 1.5% Max Health Per Second. Section II: 100% Mana Refund On Abilities. Section III: +25% Magical Power. Section IV: +35% Magical Power Contribution to Basic Attacks. Abilities still require enough mana to cast to be refunded by Section II. Reduces Attack Speed by 20%. Can deal a total of 100/140/180/220/260 (+80% of your magical power) damage. Isn't affected by healing reduction. 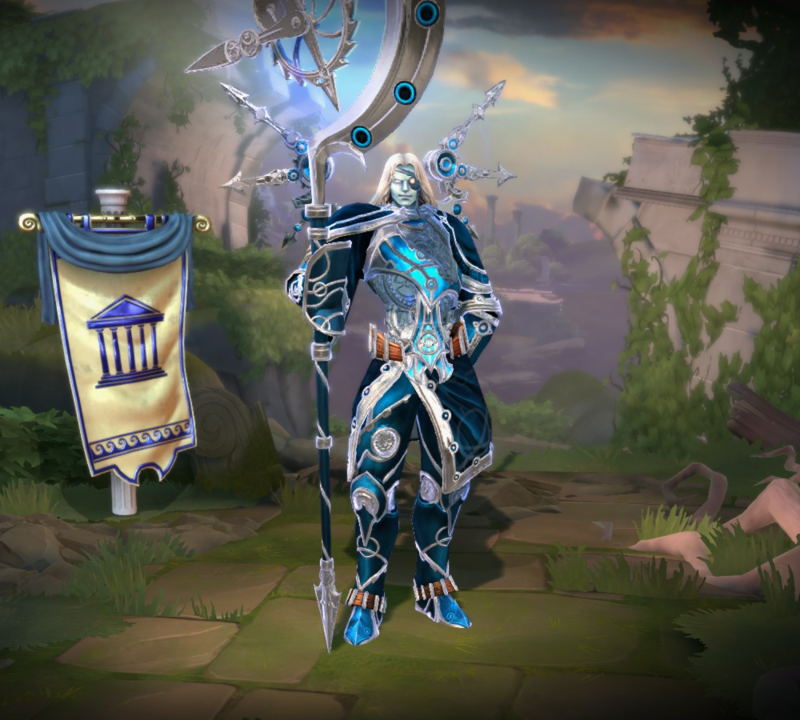 As Chronos use your ultimate while you're below 15% Health and return back to full health. One of Chronos' phoenix kill quotes, "In time even stars burn out! ", is a reference to the same quote from the novelization of Star Wars Episode III: Revenge of the Sith. Two of Chronos' taunts, "Time brings all things to pass!" and "Time brings all things to pass, even you! ", is a reference to the Ancient Greek tragedy Prometheus Bound which was written by the Ancient Greek tragedian Aeschylus. One of Chronos' taunts, "The two most powerful warriors are peace and time! ", is a reference to a quote made by the Russian novelist Leo Tolstoy. One of Chronos' jokes, "Time is like a big ball of wibbly wobbly, timey wimey stuff." is a reference to the British science-fiction television programme Doctor Who. One of Chronos' jokes, "Like sands through the hourglass, so are the days of our lives. ", is a direct reference to the intro of the American soap opera Days of our Lives. 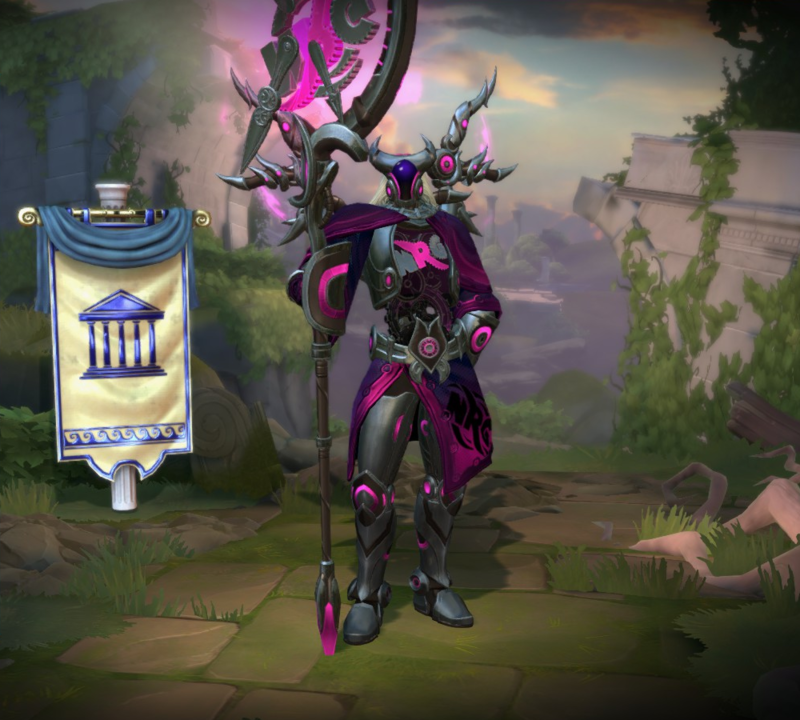 The name of this skin could be a reference to the British television series Doctor Who. Curiously, this skin and Gatekeeper Janus share the same color scheme. Chronos' Fallen Lord skin was based on the fan concept that won the SMITE's 2nd Birthday's Skin Contest. This skin is a reference to the Nintendo 64. His line for when he uses his ultimate, Rewind, "I'll be back!" and his line for placing a ward "I'll be back... for you!" are references to the movie Terminator. Chaac and Bizzy B Cupid also make reference to this movie. This skin directed taunt towards Janus, "You weren't thinking with portals! 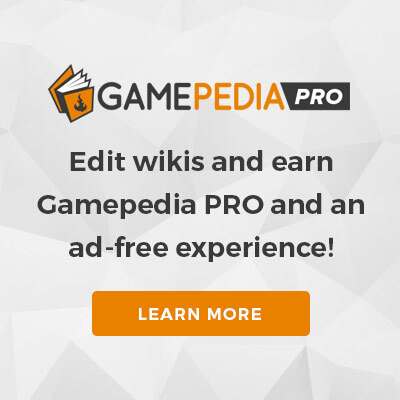 ", is a reference to the puzzle videogame Portal. This skin is based on the concept of the anthropomorphized depiction of time. The actor who did the voice for this skin, J. Michael Tatum, also voiced Dragon Knight Ao Kuang,Fernando Ares, Chaacolate Chaac, Lord Slashington III Fenrir, Hercules, Hug Bug Khepri and Sun Wu Xing Sun Wukong. Unlocking the skin during the Odyssey 2015 would also give you the Gears avatar. Increased Basic Attack Power from 35 to 40. Increased Magical Power per Stack from 3 to 5 (75 to 125 at 50 Minutes). Description changed to include all details of the Wheel of Time. This Ability still functions exactly the same as it did before 4.13. Increased Base Damage from 40/60/80/100/120 → 50/70/90/110/130. Decreased Cooldown from 120/110/100/90/80s → 100/95/90/85/80s. Increased Magical Power of Section III buff from 20% → 25%. Increased Basic Attack Power of Section IV buff from 35% → 45%. Increased Movement Speed from 20% initial + 4/8/12/16/20% → 25% + 12/14/16/18/20%. Increased damage from 30/50/70/90/110 → 40/60/80/100/120. Fixed FX showing up enormous to players at a distance. Fixed clipping issue when using Dance emote in lobby. Cooldown increased from 16/15/14/13/12 to 18/17/16/15/14. Section II Mana refund increased from 75% to 100%. Mana cost reduced from 70/75/80/85/90 to 60/65/70/75/80. Fixed an interaction issue with this ability and Portal. Now properly updates the stats UI for all quadrants. Improved visual presentation of rewind ball (smoothed client simulation). When using Blink or Teleport, Chronos will now regain the health and mana values from 8s ago. The slow-to-stop effect will no longer be applied to targets that are immune to slows at the time of application. Increased cooldown from 15s to 17s. Decreased attack speed bonus from 20/25/30/35/40 to 15/20/25/30/35. The additional benefits granted by Wheel of Time when Accelerate is activated now last 7 seconds to match the duration of Accelerate. Over the weekend, fixed an issue where sometimes he would deal too much damage with his basic attack when selecting the IV quadrant. The duration of this ability has been reduced from 8s to 7s. The additional movement speed gained over time has been reduced from 10/15/20/25/30% to 4/8/12/16/20%. Improved FX on build up. Heal 1.5% of his maximum health per second. This ability now updates the movement speed on the hud. Chronos has been added to the game. Section II's effect still requires enough mana to cast the abilities.